Introduction: The Benedictine abbey of Cluny, founded in AD 909, was a unique phenomenon: in liturgy, art and politics, its spiritual and secular power, as well as its influence, were long unrivalled. With a system of dependent priories and the promotion of Cluniac monks to important bishoprics, including that of Rome, this influence spread directly or indirectly to the greater part of Europe during the eleventh and twelfth centuries. Led by a succession of remarkable and long-lived abbots, including Hugues de Semur (St Hugh — ruled 1049-1109), Cluny became the most powerful of all medieval monasteries; its prestige and authority equalled and on occasion even surpassed that of the pope. The monastic regime at Cluny and its daughter houses was characterised by very long services, a complex liturgy embellished by music, rich ornaments and sumptuous vestments, performed in buildings of extreme splendour. The wealth that allowed Cluniac monasticism to reach its material apogee came in the main from the extensive lands which the abbey acquired in Burgundy and elsewhere, thanks to the generosity of kings, lords and countless lesser figures, and from revenues generated by the passage of popes, pilgrims and other visitors. To serve the domestic needs of the mother community, a town grew up at the gates of the abbey in which traders and merchants, men of law and craftsmen of all sorts soon established themselves. Many poor people, too, flocked to Cluny to seek the monks’ charity. In broad outline the fortunes of the town in the Middle Ages, as far as we can reconstruct them from exiguous records, followed closely those of the great abbey which reached its peak in the early twelfth century. 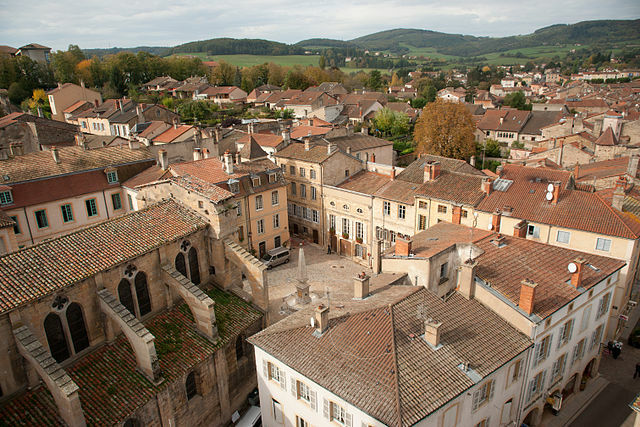 This can still be graphically witnessed today in Cluny where not only the surviving street plan and the enclosing monastic and urban enceintes but many of the houses themselves date from the twelfth and thirteenth centuries, the period when Cluny enjoyed its greatest economic success. Despite the many centuries since the abbey’s heyday, the urban community that initially grew in its shadow is still in many respects essentially a medieval town, not least because around 150 Romanesque houses survive, more than a few of which are still being used for the commercial purposes for which they were originally built.